Twitter announced on Wednesday it will now let any user apply to have their account verified. However, will more accounts actually gain Twitter verification? The answer appears to be yes. This got me wondering, along with many other social media geeks… What’s the real reason Twitter was making this fairly high profile change? Was this a PR play to increase daily active users? Was it in an attempt to reduce the on-going issues of trolls and abuse on the platform? Was it to reduce the workload of Twitter staff who get inundated with requests for verification via email? I was sceptical, and questioned whether Twitter would verify more accounts versus what it has done in the past. My hunch was they would get millions of requests within days, but no change in verification volume would be seen. I decided to dive into the limited data available to find out whether my hunch was right… or not. To do this, I used TwitterCounter to identify the total number of accounts Twitter’s official @Verified account was following, and how that broke down per day in 2016 (so far). 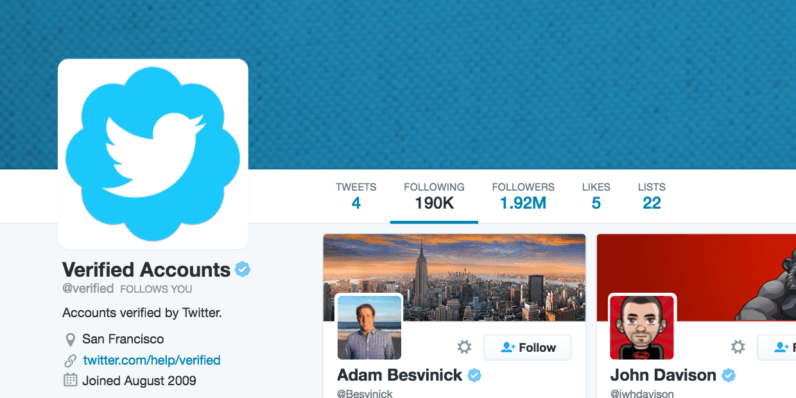 FYI – Twitter’s @Verified account automatically follows all newly verified accounts. Now, although my methodology may not be 100 percent accurate, it should give us a good indication of what’s going on. So there we have it! It does in fact already appear that Twitter is verifying more accounts than it previously has (per day on average and in total). Of course, it’s early and Twitter is not stupid. They know this data is not hard to find, and may be wary of people like me checking what impact their verification process change actually amounts to in real terms. This could just be a short term rise while people are focusing on Twitter verification. Also, the numbers here are fairly small to make watertight conclusions from just yet. However, if this is a longer term trend, you may best get on with your application for Twitter verification and see what happens. Bear in mind though, this data suggests Twitter is verifying only 219 accounts per day, on average. That equates to a microscopic 0.000070 percent of its total monthly active users.